Hi Friends! We haven't seen you since Cranksgiving, but now the daffodils are blooming and we're ready to pedal. Join us Saturday April 7 when we roll-out from the Wright Park playground at 1pm and pedal downtown about 2 miles to Tinkertopia. 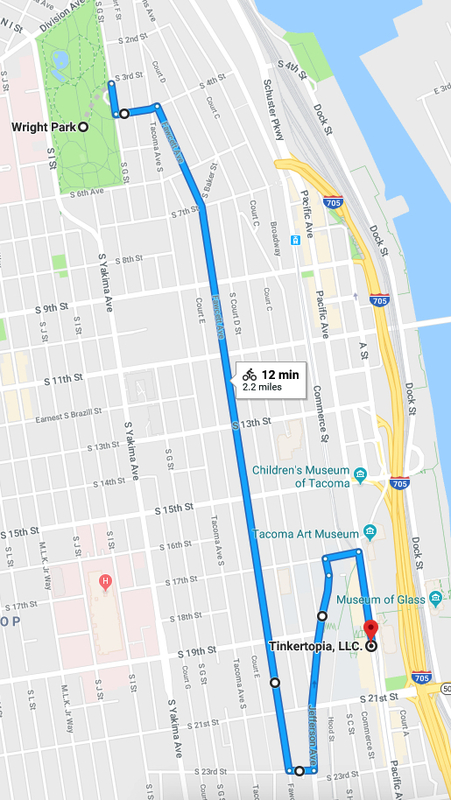 This is an afternoon ride because the Daffodil Parade is happening downtown that morning. Feel free to pack a lunch and have a pre-ride picnic if the weather is nice. There are bathrooms and picnic tables near the playground. The ride to Tinkertopia will be pretty quick since it's nearly all downhill! You can see on the map that we're taking a switchback approach to help make this more manageable for smaller riders with coaster brakes. We'll check out the shop for 15-20 minutes or so before heading back up the hill to Wright Park for a snack and more play time. We'll have an extra long cable lock to help secure bikes while we're in the shop. 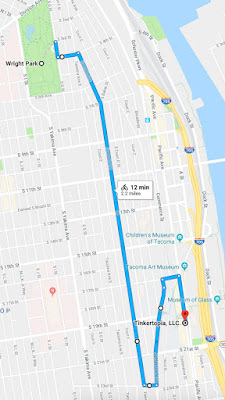 Yes, the return route is mostly uphill, but we may hike-a-bike a few steep blocks to get back on the Fawcett Ave bike boulevard in order to help manage the steep terrain. We'll still ride in a drizzle, but extreme rain will cancel. Dress for the weather. Each rider will receive a coupon from Tinkertopia for buy-one-get-one free tinker time session in their creative maker space. No purchase necessary, and it can be used on a future trip to Tinkertopia. Bonus! This is part of a year-long Bike to a Business program organized by Downtown On the Go that highlights downtown businesses that want to encourage their customers to try biking. Questions? Feedback? Ideas to make this more awesome? Leave a comment! You can also RSVP and follow us on Facebook.